The centre for Research into Education, Creativity & Arts through Practice (RECAP), located in the University of Chester are delighted to present a collaborative event with the National Arts Education Archive (NAEA). The National Arts Education Archive: Playful Cultural Encounters through Time will explore the history of arts education and engage gallery visitors in the theme of movement through activities based on the Archive’s collections. This interactive event will include games and workshops which explore learning and education through play. Visitors will be invited to participate in activities and games such as Lego constructions, chess, consequences, jigsaws, playing cards and dominos, in response to a display of corresponding historical objects and materials from the Archive. The event will also include the Tate Liverpool Photographic Grid 2019: Sensing the Environment, by photographer Dave Allen, where visitors will be invited to participate in a photographic exploration of the gallery spaces and its immediate environment. RECAP specialises in practice-based research into creativity, learning and the arts, in professional educational contexts through international collaborations. The Centre is located in the Faculty of Education and Children’s Services, in collaboration with the Faculty of Arts and Humanities at the University of Chester. The NAEA was founded in 1985, at Bretton Hall College, and housed in the purpose built Lawrence Batley Centre in 1989. Following the closure of the college the Archive was gifted to Yorkshire Sculpture Park, which maintains the active and lively operation of the Archive with dedicated YSP staff and volunteers. 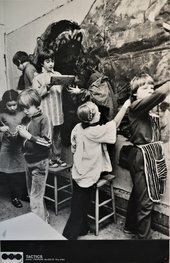 As a research facility with over one hundred catalogued collections, the Archive documents the development of art education both nationally and internationally.